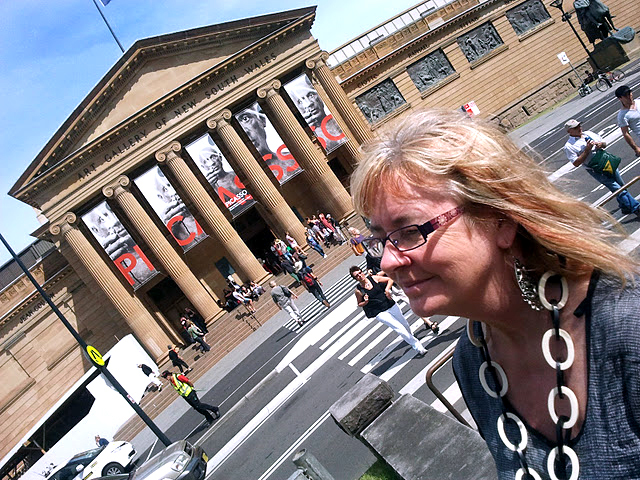 Me outside of Picasso exhibition at Art Gallery of New South Wales, Sydney, this afternoon. Some comments on a couple of the spontaneous aspects to this photo!...it was the one Rodney accidentally took when lifting the camera into position and is the best one of the subsequently posed snaps. I like the strong diagonal lines created by the road, the zebra crossing, the pillars of the building and the triangulation of the roofline of the building. One aspect of spontaneity I found a little disconcerting was looking a bit like I was sniffing the lady in the backgrounds armpit...but at least she was wearing black and white. I liked the exhibition. It was a good overview of Picassos long career, spanning some 70 years. There were some phases of his aesthetic and practice which seem to be less known and publicised that were a bit of revelation to me.